Sean Russell, a rising star in marine conservation and outreach, has received a national-level Brower Youth Award for launching an educational campaign about marine debris — a project that ties back to his high school internship at Mote Marine Lab. Russell, who graduated from the University of Florida in December 2013 with a degree in Biology, became interested in marine environments through 4-H marine science projects and his internship at Mote, which helped him understand the negative impacts of marine debris like fishing line on dolphins and other marine wildlife. 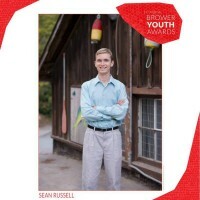 At age 16, Russell worked with Mote, 4-H members and his family to create the Stow It-Don’t Throw It Project (http://www.stowitdontthrowitproject.org/) — an effort to keep fishing line and other debris out of the ocean and prevent it from harming marine wildlife. Since then, Russell and his team have carried the project forward and helped young people from multiple states join in. In 2011 Russell launched the annual Youth Ocean Conservation Summit at Mote, where youths can gain skills to launch their own conservation projects. The Summit has inspired hundreds of students across the country to get involved in ocean conservation, and a series of youth-led satellite summits are starting this year, beginning with events at the National Aquarium and the Seattle Aquarium. Russell considers the award an important milestone in his mission to help the oceans. This year’s Youth Ocean Conservation Summit, on Nov. 8 at Mote, is sold out. However, the public can still RSVP for the related Community Ocean Conservation Film Festival — a free screening of the film “Mission Blue,” which shares the story of ocean pioneer Dr. Sylvia Earle and her mission to protect the sea. The festival also allows visitors to see other short films and projects by current and past participants in the Youth Ocean Conservation Summit. This free film festival starts at 6:30 p.m. on Nov. 8 in the Immersion Cinema at Mote Marine Laboratory, 1600 Ken Thompson Parkway on City Island, Sarasota.